We'll be back with more Scottish Premiership coverage on Wednesday, please join us then. Celtic manager Brendan Rodgers praised 18-year-old Ewan Henderson for his full debut. "We had to put every ounce of energy and spirit into the game and at 2-1 there’s always the chance something could go against you," said Rodgers. "I thought Ewan Henderson was outstanding, a young player that’s still got a lot of physical maturity to take place but his composure on the ball, his touch and his ability to intercept and defend was there, so rightly he got man of the match. "At 18 he’s a big talent. His view of the game is really special, he understands football. Brilliant performance by him." Brendan Rodgers was disappointed with James Scott's actions that led to Motherwell's goal. "It was a really disappointing act on a football pitch," the Celtic manager told BBC Sportsound. "My players, they’ve had a tough game on Thursday [losing 1-0 to Valencia], playing virtually an hour with 10 men, coming into a tough game today, against a team that's doing very well, go 2-0 up, good goals, good quality, so to have that control in the game, then to have that goal against you. "Sometimes the referees up here have criticism but today the criticism goes to players because it wasn’t a good act at all. "And Motherwell have the chance to redeem themselves and maybe let us score but it isn’t the case, they want to play on and push for an equaliser. "And that’s why I’m so proud of the team, they then showed not just qualities, but guts, determination, players out of position and young players like Ewan Henderson - to get on and get the 4-1 win I'm so proud of them." 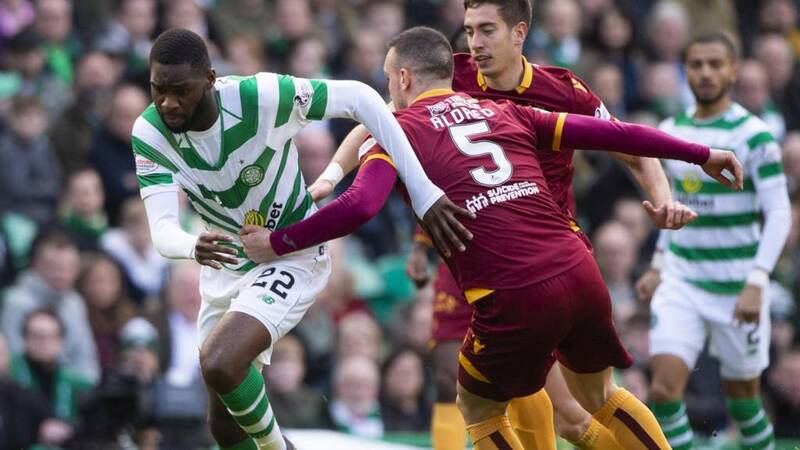 Motherwell boss Stephen Robinson also commented on the controversial goal for the Steelmen after James Scott played on from a throw-in when Celtic were expecting the ball back and it eventually led to Gboly Ariyibi finding the net. "In truth, I didn't know what to do," Robinson said. "You've got a young boy, starting his first game, 18 years of age, on a couple of hundred quid a week, great prospect, super, super boy that we have real high hopes for. "He got caught up in the occasion. It shouldn't have happened but it did and he'll recover from that. He's going to be a top, top footballer. "It'll deflect from how good a performance we put in. There's so many good things in that game. Did we deserve to lose 4-1? No, we didn't." Motherwell manager Stephen Robinson provided an updated on the neck injury sustained by Carl McHugh, telling BBC Scotland: "It's a little bit of a disaster for us. "He's been knocked out cold. He's on his way to hospital now to have his neck scanned. We're extremely worried about him. He won't play for the foreseeable future." Rangers players "stepped up" without talisman Alfredo Morelos, said manager Steven Gerrard as they hammered Hamilton 5-0 earlier today. The Premiership action continues with five matches on Wednesday. Please join us then for more live text and radio coverage. Had Motherwell gone on to take anything from the game, the controversy over the Gboly Ariyibi goal would have raged long and hard. As it was, it was academic, Celtic’s class coming to the fore with those late goals from their record signing, Odsonne Edouard, and the most expensive Scottish player ever, Oliver Burke. So there's no change at the top of the Scottish Premiership with Celtic ending the weekend as they started it with an eight-point lead over Rangers after both sides won today. Aberdeen, having won yesterday, are five points off Rangers but four points clear of Kilmarnock. Motherwell's run of six straight wins comes to an end but they are still within touching distance of the top six - two points below Hibernian. Hamilton, meanwhile, remain second bottom - below Dundee on goal difference and four points clear of St Mirren. Celtic re-establish their eight-point lead at the top of the Scottish Premiership after another comfortable win but there was stage in the game when it was not so comfortable. Motherwell's controversial goal had no bearing on the final outcome in the end but will no doubt be a talking point in the aftermath. The nine minutes of added time came after a lengthy injury stoppage involving Carl McHugh, who was taken off on a stretcher, while the hosts also had an enforced change with Ryan Christie going off. Both sides play again in midweek with Celtic away to Hearts and Motherwell visiting Kilmarnock. Scott Sinclair is put in on goal by James Forrest but is crowded out in the Motherwell box as goalkeeper Mark Gillespie comes off his line. Dedryck Boyata cuts out Gboly Ariyibi's low cross just as Conor Sammon waited to pounce in the middle. It was an important intervention from the Celtic defender that took the ball just wide. Well's Jake Hastie has been booked for a foul on Jonny Hayes. It's a fourth for Celtic and a fourth for Oliver Burke since he joined the club last month. He finishes with some style after being found by James Forrest. There's a coming together between Celtic's Kristoffer Ajer and Motherwell's Jake Hastie after the pair tussle deep inside the Celtic half. Referee Kevin Clancy has a word with both.